Nancy Pelosi Tweets Eric Cantor She's Already Got SOTU Date : It's All Politics Pelosi told Cantor she had already committed to Rep. Roscoe Bartlett, a Maryland Republican. Here's hoping she or an aide called Cantor or his people first so that he didn't learn about it on Twitter. 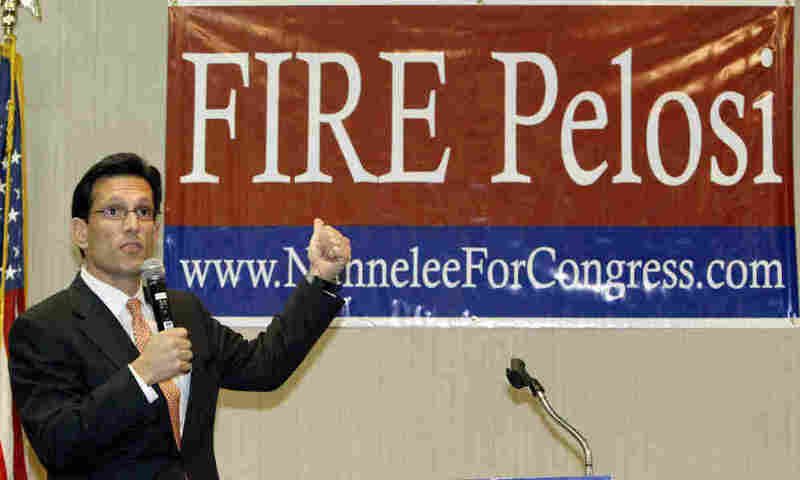 Could this 2010 photo of Rep. Eric Cantor have anything to do with Rep. Nancy Pelosi's tweet? Nahhh. Whichever Democrat winds up sitting with House Majority Leader Rep. Eric Cantor (R-VA) on what's being called bipartisan "date night" will likely know that he or she wasn't the House Republican official's first choice. That's because Rep. Nancy Pelosi, the former House speaker and present minority leader, tweeted an apology to Cantor for being already booked. Here's hoping Cantor or one of his aides at least got a phone call beforehand, that they didn't have to read it first on Twitter.